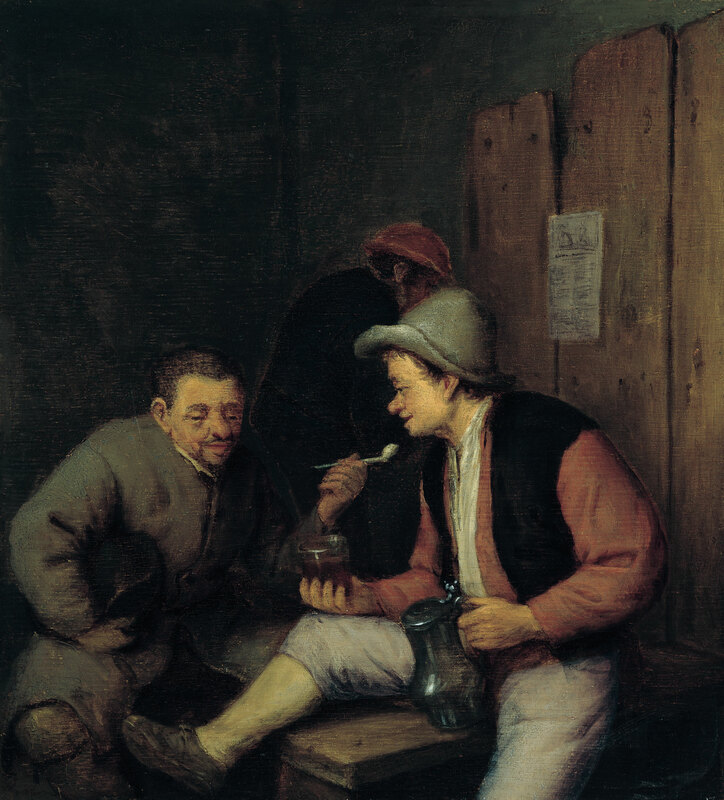 Viewed three-quarter length, three peasants drink and smoke in a tavern. In the right foreground a main in red shirt, black vest, and short-brimmed cap holds a glass and a pewter pitcher as he sits casually with leg up on a wooden bench. His seated companion wears a grey coat and leans forward, hat under one arm and a clay pipe held in the other hand. Behind them a third standing figure is just visible. To the right is a wooden partition to which an illegible broadside has been affixed. Adriaen van Ostade painted many images of peasants carousing in dark taverns and disheveled barns. He favoured a squat but nimble figure type with broad and animated features. His peasants descend from the 16th century comic low life traditions of Pieter Bruegel and were much influenced, especially in the 1630s, by the raw and vital peasants painted by the Flemish painter, Adriaen Brouwer. However even in their coarsest and most caricatured early form, van Ostade's peasants never had the gross and unapologetic realism of Brouwer's brutish characters. Rather they always appear more civilised and amiable, indeed as time went on became comfortably stout and domesticated. Some authors have seen Ostade's increasingly contented peasants as a reflection of his own biography; the painter enjoyed greater prosperity after an advantageous second marriage. Be this as it may, his peasants were never socially unsettling or revolutionary, rather they seem picturesque, calculated to put the middle class purchasers of such art at their ease. Ostade was recorded in a document as an active painter as early as 1632 and had begun painting peasants in taverns, smoking, drinking and gaming by the following year; see for example the painting dated 1633 in the Hermitage, St. Petersburg. He would eventually paint scores of such pictures, both on a full length and a three quarter length format. Designs of the later type bring the viewer in close proximity to the action and increase its immediacy. Two of the finest of these three-quarters images are in the Gemäldegalerie, Dresden, and the collection of Herman Shickman, dated 1667. When the present work was with the dealer P. de Boer in 1969, it was said to have a companion piece that was dated 1661. However its style, which is broader than the artist's manner of the 60s (although this may be partly a result of the present work's somewhat abraded condition), would seem to suggest an earlier date. It may be compared for example to the Peasants Smoking, dated 1645, that was in Baron Janssen's Collection, Brussels, sale 26 April 1927, lot 86. Adriaen van Ostade drew extensively and left us many preparatory drawings for his paintings and prints. While there are no known studies for the present work, the man with the pewter pitcher and his leg up on the bench resembles a figure in a sheet in the Kunsthalle, Hamburg, which was a study for an etching by the artist of 1653.